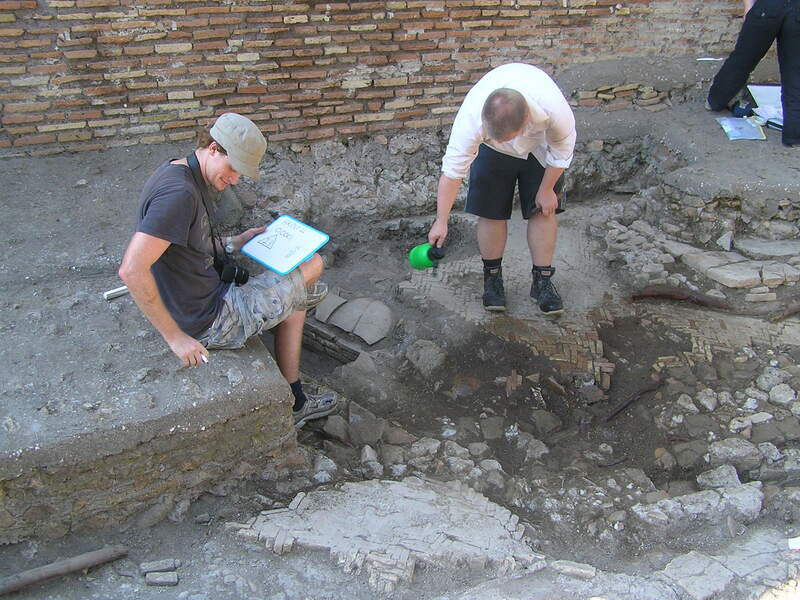 The Nymphaeum Bivium is being excavated by Dan Jackson (above with spray can), supported by Joe Williams. Dan has made a great start, reopening the trench of last year to try to resolve some of the tricky stratigraphic relationships found there. 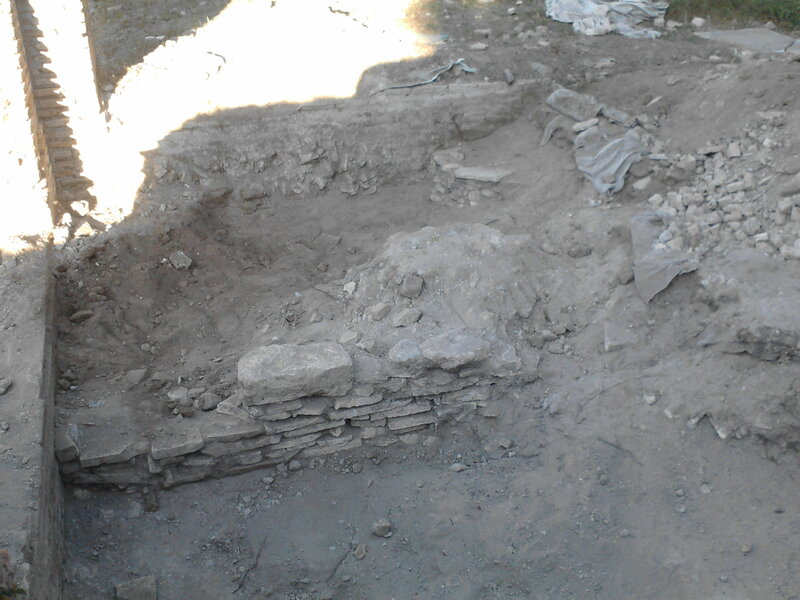 It seems that we have found the front wall of the fountain’s basin, which has long eluded us, and part of its floor. Today a foundation deposit containing a domestic rubbish layer (and not an infant burial as previously thought) was brought to light. We hope that this will provide vital dating clues to primary phase of the structure: a large marble coated fountain, of which Solinda Kamani is painstakingly recording the decoration, which was attached with iron nails and marble dowels. On the Foro della statua eroica, Zsolt Magyar is continuing his work, assisted by Doug Watson and others. Doug and Jay Ingate have cleared out a huge layer of excavation backfill from the early 20th c. and have exposed the a part of floor of the baths which preceded the foro and a large dump of mortar-filled rubble, intended to fill the bath rooms prior to the building of the new square. In doing so, some well-built early imperial concrete walls have been exposed, along with early medieval tile retaining walls, without any mortar. The decline and fall of Roman building seems to be visible in just one trench. Finds include the remains of excavation pegs from the early 1900s and also a tourist path from more recent times. This trench is bound to develop however, as we dig out the medieval layers. In the depot, we have been privileged to enjoy the company of Alessia Rovelli, a coins specialist, and Will Foster, a professional illustrator. They have been struggling for work space, whilst the plaster and marble recording reaches a high-point of intensity. We hope to have all workers involved in this recording back on site in a couple of days, to note decorative traces in the actual walls. In the meantime, Alessia has been able to give approximate dates for many of our coins, although they did not contain a great number of late antique examples. She pointed out that Ostrogothic coins are often only 9mm in size, making it necessary to sieve the soil with even a 5mm mesh, as it comes out of the ground. Will’s work is equally impressive and we hope to have examples of it to post shortly.